Burlington High School (BHS) has become the second high school in the country to fly the Black Lives Matter flag. Nearly 1,000 students and staff participated in a brief and optional ceremony held during noninstructional time on Monday afternoon. 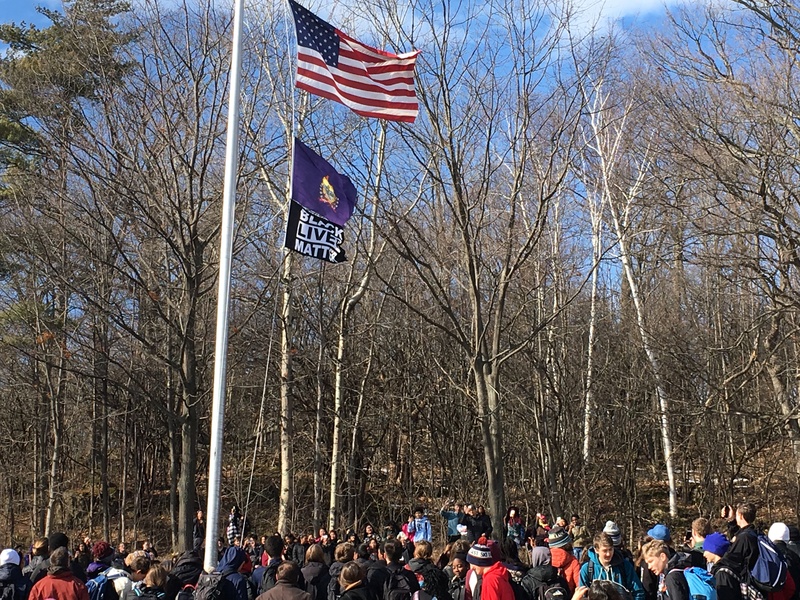 Flown below the American Flag and Vermont’s State Flag on the school’s only flagpole, the Black Lives Matter flag is flown in honor of black history month and will remain up throughout the year. “With the overwhelming support to fly the Black Lives Matter flag, we feel that this is an important step in creating a welcoming environment for students of color and is a crucial advancement in the district-level conversation about race,” said the student representatives from the SJU. The ceremony began in the school’s auditorium where several students from the high school addressed their peers, state legislators, students and staff from Montpelier and South Burlington High Schools, and local elected representatives including Mayor Miro Weinberger, members of city council, and the school board. Following the comments, Superintendent Obeng expressed his gratitude to the kids in the school who participated in the event.